I’m a huge sucker for paper. It’s so hard for me to pass by the paper stacks at craft stores without stopping to buy. Even if I don’t have a specific project in mind-because I may in the future right? I was making one of my weekly dollar store runs when I saw a really cool mirror frame. It had cut outs in it that I thought would make a really cool piece of artwork. And because it was already black, I decided to go with a Halloween theme! This became my first project for the Scrapbook USA Design Team (can I tell you how excited I am that I made the team?!!). 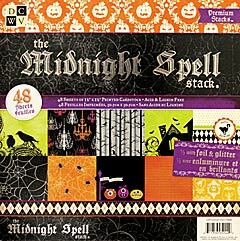 I was sent the Die Cuts With A View “Midnight Spell” paper stack. The awesome thing about this paper is that is foil and glitter on several of the papers and some great designs on all of them. They were all interesting and it made it hard to choose which six I was going to use for the spaces in my frame. The project itself is really simple. And I forgot to take pictures because of its simplicity. Basically, I popped the mirror out and tossed it. I have little ones and didn’t want extra glass lying around. Then, I took my papers and decided which space I wanted each to go in. I used the frame itself to trace the different shapes on each piece of paper. Next, I traced the shapes on the cardboard backing to the frame. That way, I would know exactly where I needed to glue each piece down. It saved on the headaches of having to rearrange things. Once I had the pieces all laid down, I modge podged them to the cardboard and put a coat over the top as well as extra protection (I use the Hard Modge Podge). The frame looked pretty cool with the different papers, especially because of the glitter and foil. I used four pieces of glitter or foil papers and two patterned papers in the middle. It still needed more dressing up. So, I added a pinwheel and used one of the little word art pieces that came in the paper stack for the middle. It says “Eat, Drink, and Be Scary”. Again, it still needed more. I had some great ribbon that I bought at Michaels from their Halloween line (they have a ton of cute ones!) and hot glued it to the top and bottom of the frame. I loved it but still wanted a little more. So, I added a little Halloween banner, again with more paper from the stack. I used some of my gray baker’s twine and hot glued the sides on the back of the frame. I also inked the edges. Finally, I added one more piece of word art from the paper stack with hot glue. Voila!!! A great, fun, different, and cheap piece of decor for Halloween. It’s great because my hubby doesn’t like any of the gross, ugly stuff.